Wet Rocks Diving likes to dive in both Kona, Hawaii and North Florida. 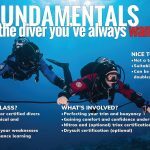 Here’s some info on diving in these locations. Coming soon!… other diving locations and destinations Wet Rocks Diving has visited or frequented!